Last year Google introduced Google Feed to surface relevant content to mobile users. Dramatic growth has seen more than 800 million people each month use the feed to stay up to date with their interests and hobbies online. On September 24, Google announced that Google feed will be replaced by Google Discover. 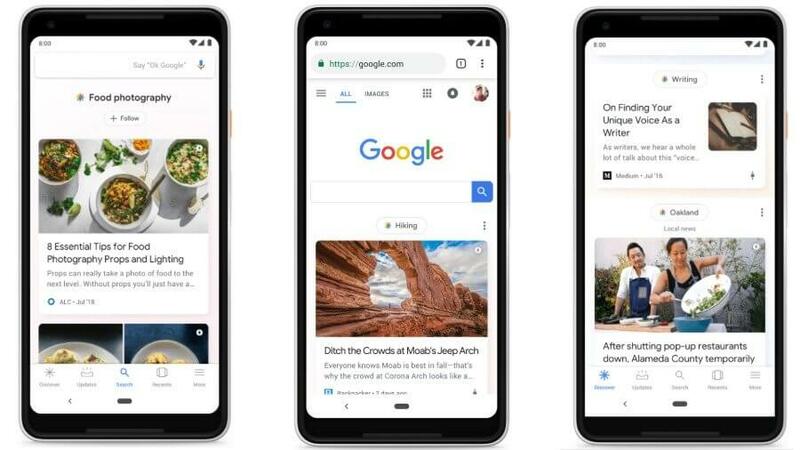 Google Discover displays content beneath the search bar on Google’s mobile search app, tailored to the user. Content recommendations are based on data in a user’s Google account, such as web activity, device information, location history, and location settings. Users can follow or unfollow ‘topics’ that Google finds for them, for example, “Gardening,” “Cooking Tips” or “Manchester United” depending on their interests. It provides relevant content to users on what they want to keep up to date with, without them even searching for it. An important feature of Google Discover is that unlike the previous Google feed, it presents relevant “evergreen content” to users and not just recent news stories. It provides an opportunity for publishers to have their content served to users who aren’t searching but are likely to be interested. It’s another indication of the importance that Google places on creating high-quality, information-rich content that provides value to your users. Google Discover seems to be rolled out in the US only so far. If it proves as successful as Google feed, we can expect to see it rolled out internationally in the very near future. Read more about the rebrand of Google Discover on Google’s blog. Find out more on the SEO Industry with our Search Marketing News articles.